This week, go to a party with no limits, no boundaries, and no compromises — specifically, composer and producer Andrew Lippa’s stage musical The Wild Party, performed by the Carnegie Mellon School of Drama. Filled with nonstop action and song, The Wild Party lives up to its name as it tells the story of a tumultuous relationship between two 1920s vaudeville performers over the course of one crazy night. The Wild Party stars senior musical theatre major Claire Saunders as Queenie, the irrepressible vaudevillian beauty. Wrapped in a scintillating silver dress, Saunders absolutely dominates her place in the spotlight, bringing out Queenie’s strong personality as well as the character’s more vulnerable side. Starring opposite her is senior acting major Brian Muller as Burrs, Queenie’s darkly passionate but abusive lover who becomes increasingly desperate as he fears that Queenie will leave him. Muller’s performance is a difficult balancing act that evokes both sympathy and revulsion for the character. Senior musical theatre major Zanny Laird portrays Kate, a prostitute and professional party girl who tries to seduce Burrs. Laird, who goes above and beyond in providing the energy needed for the role, is always fun to watch whenever she appears on stage. Finally, senior acting and musical theatre double major Daniel Bellomy is Black, a mysterious gentleman stranger who, despite being the opposite of the explosive Burrs, catches Queenie’s eye. Bellomy is smooth, dapper, and emanates an air of enigma as he seduces Queenie during the course of the play. While the performances are top notch, the best part of the production is assistant professor of dance Tomé Cousin’s mesmerizing choreography. It is a perfect mix of anarchy, sexuality, and elegance — the very embodiment of a party in the Roaring Twenties. Like Jackson Pollock’s drips of paint, dancers flip and turn, tumble and twist, frisk and rumble as they weave among each other. There is always something to look at; at times it becomes almost overwhelming. The choreography is at its best at its most ferocious. For instance, in the sequence “The Apartment,” when Burrs assaults Queenie, Saunders is roughly and continually thrown onto a bed like a doll. While it is clear that this is only stage action, it nonetheless brings about a sense of danger and apprehension. The lively party sequences are just as well executed; the amount of activity and motion make it feel like a party thrown by Jay Gatsby although there are only a dozen actors on stage. Acts like “The Juggernaut” and “A Wild, Wild Party” feature exuberant, flawless dancing in which the partygoers move as one cohesive whole. Further accentuating the choreography is the dusky, sensual lighting. Deep, saturated hues and shades create intense moods — from a sweltering New York City apartment in the summer to a hazy daze of drunken blue. 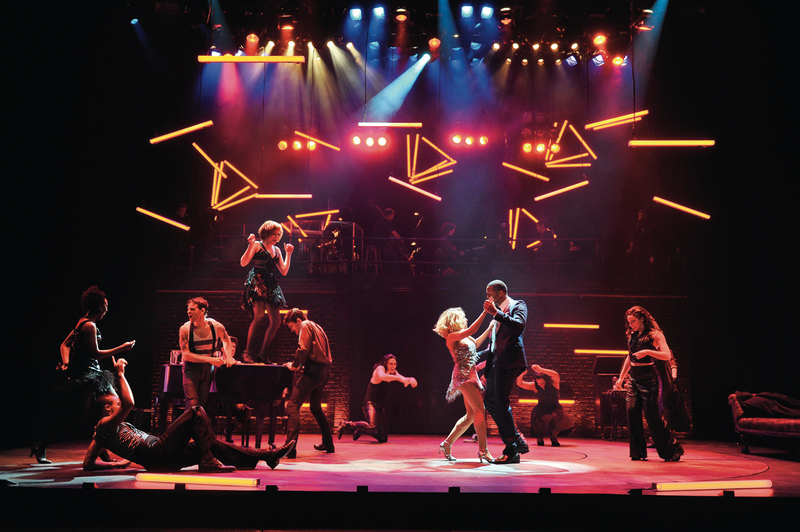 Furthermore, a rotating stage is used in certain acts, such as “Queenie Was a Blonde,” “A Wild, Wild Party,” and “Come with Me,” to show off more of the amazing choreography and focus the audience’s attention on the central action. Of course, a party is nothing without music, and The Wild Party brings a mixture of hot jazz, high swing, blues, and gospel, although it veers from actual 1920s music toward more like something you would hear in West Side Story. Nonetheless, it still has the brassy flavor and bravado necessary to complement the action on stage. The music never stops; each song blends seamlessly into the next, as if the whole show is simply one extended piece of music. The songs themselves span across a range of moods. “Out of the Blue” expresses Queenie’s desire to renew passion into her love life. “An Old-Fashioned Love Story” is a hilarious piece sung by a desperate lesbian looking for love. “Look at Me Now” and “Life of the Party” display both the light, fun-loving and darker, attention-seeking sides of Kate’s character. “Two of a Kind” is an adorable love song between a boxer and his girlfriend. “What Is It About Her?” is Burrs’ song of his deep, dark obsession with Queenie. “Let Me Drown” is about forgetting your worries in a bathtub of gin. The Wild Party also features beautiful vintage-inspired costumes. Although many costumes bear the trademark feathers and sequins of the ‘20s, the crisp, dark colors of the costumes have almost a Gothic feel to them, which tonally reflects the appending danger and dark end to the story. The Wild Party is essentially a modern take on the 1920s, but it remains true to the spirit of the era. It is raunchy and relentless, and rides on a wave of chaotic energy toward its dark, accusatory ending. The School of Drama’s production is truly a feast for the eyes and ears, and kicks off its centennial year with a bang. The Wild Party will be playing in the Phillip Chosky Theater at the Purnell Center for the Arts through March 1.